I find that I am suddenly overscheduled for book reviews/tours in March. Why is everyone launching stuff in March??? Anyway, all that means is that I guess I'll be posting reviews more than twice a week this month then, and will slow down later on. 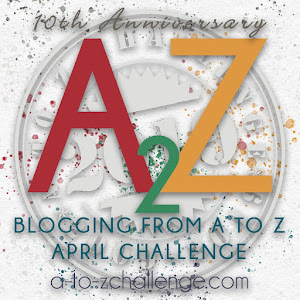 The other question is really whether I should do A to Z this year or not. I have so many things to do. If I get round to them. So it's really a question of what I want to prioritise, but I really don't want to think about it or make a decision. So. There's a poll somewhere on the right sidebar that you can vote on. To me, and this is the same thing I've decided for myself, is if it's March (or nearly March) and you can't make up your mind about A-Z, it's probably a good idea to not do it. I am not going to do it this year, for pretty much the same reason. I also have at least five other projects in the works that would have to get shoved to the side to do A-Z, and I'm not willing to sacrifice them this year. I guess I'm undecided because I kind of want to do it, but I don't know what about. At the same time, I know I should focus on my existing stuff. Meh. I'm biased so I'd say yes, but if you feel you can't fully commit to it, then maybe staying on the sidelines is best this year. Haha. I'm itching to do something though. I just don't know what. I think if you're asking the question about doing the A to Z Challenge, that you really want one of us to push you in that direction!